Gift giving takes on a whole new meaning when one-of-a-kind beauty is layered with a piece of culture that means something deep and beautiful. Open for a limited time, November 14 to December 23, at the ECO-tique Pop Up Store in Williams Lake you can find home furnishings and décor, clothing, and accessories from places around the globe, featuring fair trade and sustainability and helping to preserve culture and build economies. 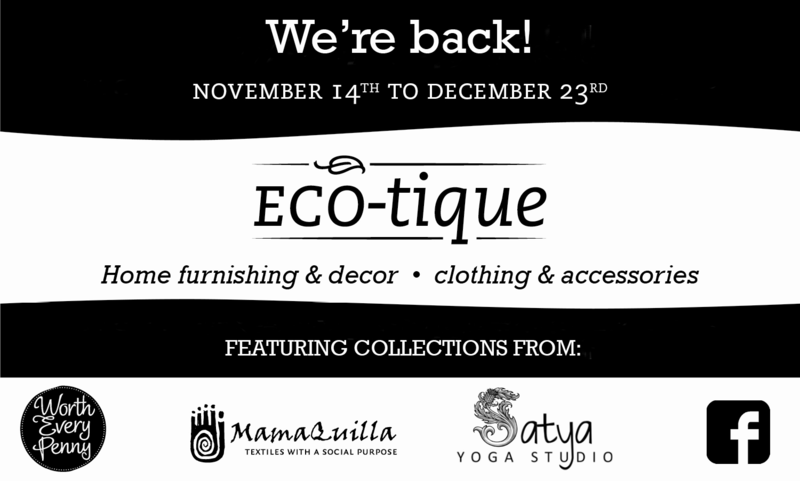 ECO-tique features collections from three local businesses: Satya Yoga Studio, MamaQuilla Textiles, and Worth Every Penny. It was a big success last year, meeting the needs of the community and delighting shoppers with beautiful, thoughtful gift options, and has returned this season to enhance the downtown shopping experience. When you give a gift from this shop, you give a piece of culture being preserved and loved. Every piece represents a living wage and good working conditions, values that are increasingly important to shoppers. LeBourdais met families working toward this restoration, including a woman named Miriam Danniarova, who was in her 70s, in Kyrgyzstan. She and her family were making beautiful Shyrdak felt rugs, some of which are featured at ECO-tique. “What struck me about Miriam was her commitment to her culture and its preservation, working at the same time to restore the economy. Miriam speaks no English. “Her youngest son, who went to Moscow and got a degree in tourism, speaks English. Since I met them, they now have some internet. The son and I email back and forth, and they can also send FedEx now,” she said. Penny Hutchinson, from Worth Every Penny, fell in love with Flores Huichol art in a small shop in Puerto Vallarta. That’s where she met artist Jose Carrillo, who told her the stories behind every piece of art. 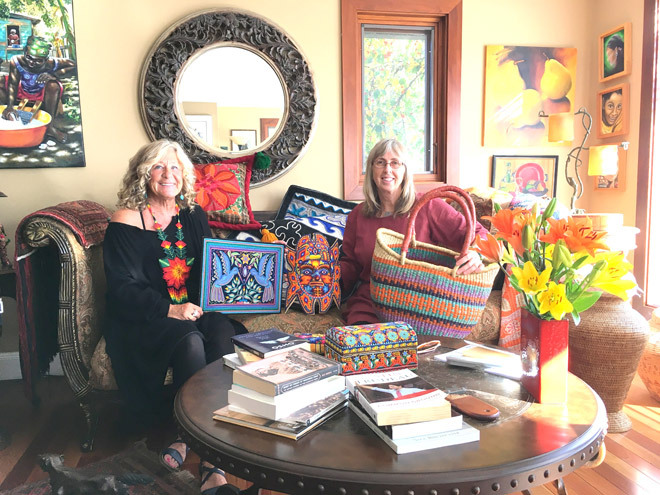 Also a great lover of Cariboo-Chilcotin beading, Hutchinson said her heart stopped when she came face to face with the detailed and exquisite Huichol art. This art includes beaded masks, framed pieces, jewellery, ceremonial bags, and beaded bowls made from gourds. She said, every bit as beautiful as the beaded pieces, are the incredible stories behind them. “The stories behind the art tell about their ancient culture and beliefs,” she said, adding that she also buys thing like beadwork and drums from local bands throughout the northern Shuswap and the Chilcotin. For more information about ECO-tique, located in Delainey’s Mall at 271 Oliver Street in Williams Lake, find the company on Facebook at The ECO-tique Pop Up Store or phone (250) 305-4422. To find out more about the individual businesses, find Worth Every Penny, Satya Yoga Studio, and MamaQuilla Textiles on Facebook, and visit www.mamaquillatextiles.com and www.satyayogastudio.ca.